The Technical Regulation department focuses on quality of supply issues Electricity Supply Industry. In addition, it also enforces standards and carries out routine inspections. The Technical Regulation Department is responsible for all engineering services required for regulatory oversight or compliance and involves the development and implementationof regulatory tools comprising technical standards, regulations, rules and codes governing the electricity network infrastructure design, operation and maintenance. 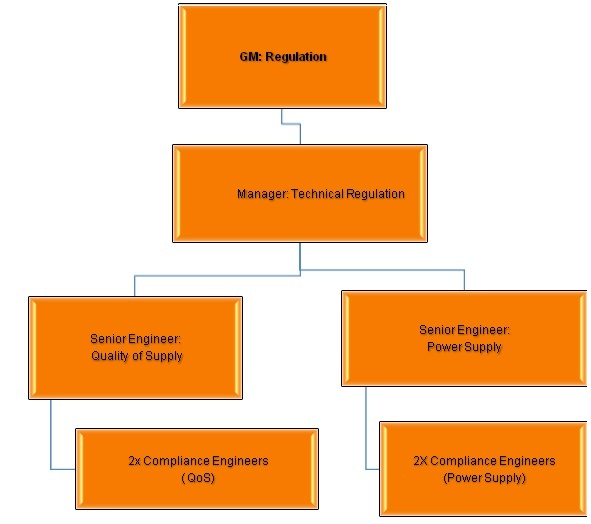 As shown in the diagram below, the department structurally comprises of four Compliance Engineers, Two Senior Engineers and a Manager Technical Regulation, reporting to the General Manager Regulation. Conducting technical Compliance audits and reporting on non-compliance issues as well as assisting stakeholders to comply. Preparing quarterly reports on the state of the Industry for the Board and for the Minister of Mines and Energy. Representing ECB in designated industry forums at national regional and international levels and participates in the Technical Regulations Sub-Committee activities of the RERA.